I was a reporter in the Plain Dealer’s Lorain County Bureau for about 15 years. On a slow news day, we’d often drive south to Oberlin. “There’s always something going on there,” we figured. Usually, we were right. Oberlin might not show up much these days in the Plain Dealer, but that’s a sign of the newspaper times, not the state of the city. Oberlin is as vibrant as ever. In recent years the city has been named the best hometown city and best intergenerational community. It attracts bicyclists and artists, music lovers and museumgoers, people seeking diverse shops and restaurants, and more. 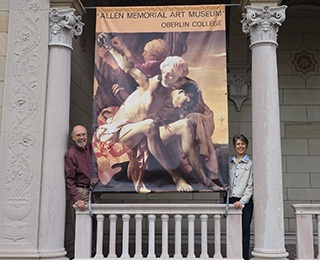 Oberlin College is certainly the city’s main attraction, with a year-round calendar of concerts, lectures and performances at the Conservatory of Music and Finney Chapel and the world-class Allen Memorial Art Museum. The downtown has an inviting appearance highlighted by historic architecture and enhances the civic, cultural and economic vitality of the entire community. Oberlin is a strong center for business as well as an entertainment and learning destination. Let’s take a tour of the town. Several miles of the paved North Coast Inland Trail cut through Oberlin, attracting walkers, runners, bicyclists, dog owners, in-land skaters and cross-country skiers. The trail is maintained by the Lorain County Metro Parks, which also operates Splash Zone, home to indoor and outdoor pools and a dog park. The Oberlin Heritage Center, with roots dating back to 1903, focuses on preserving and sharing Oberlin’s heritage. Along with year-round tours of its historic buildings, the center offers guided walking tours in warmer months that focus on the city’s history. The historic Apollo Theatre is now owned by Oberlin College and managed by Cleveland Cinemas. In addition to showing the latest popular and independent films, the theatre also broadcasts Metropolitan Opera shows. And the price is right to see a movie, with all Sunday through Thursday seats $4. Summer in Oberlin brings two annual entertaining events, and they are both free. Admission is free, but tickets must be reserved. Tappan Square is the site of several free musical concerts. People bring lawn chairs and picnics to enjoy a summer evening of music and fellowship. From coffee shops and pizza to ethnic and veggie cuisine, Oberlin has it all. Lorenzo’s Pizzeria has been the go-to spot for pizza and other Italian dishes for nearly 40 years. Many of the shops reflect the artsy, individualist and intellectual vibe of the city. Even if you do not make or wear jewelry, stop by Bead Paradise for a sensory delight. The walls and counters are lined with all sorts of beads, metals and naturals from across the world. “As a bead merchant, I feel deeply connected to the age-old traditions of the bead trade and a desire to keep beads circulating, to be the provider of beads to a new owner,” explains long-time owner Ruth Aschaffenburg, who recently stepped down and turned the reins over to her daughter. The shop also sells handmade jewelry, made from bead collections and assorted materials. Herrick Jewelry, which has been in business since 1913, sells traditional jewelry and modern designer pieces. 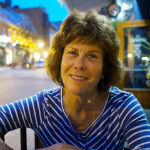 Ginko Gallery & Studio is owned by fiber artist Liz Burgess, also chair of the Kendal at Oberlin Board of Directors. The life plan community is located about a mile north of downtown. Over the years the gallery has expanded to include pottery, jewelry, glass, wood, metal, and other media. But true to its origins, most wall space is reserved for fiber art. Half of the building is still dedicated to the working studios of 5 resident artists and is open to the public. When people actually see someone working at creating art the concept of original handmade art becomes real. Then they start to understand how what we sell is unique. 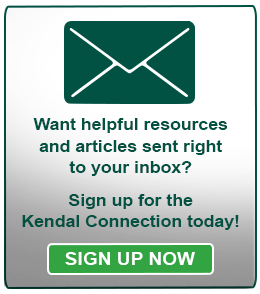 There’s another Kendal connection at Ginko. Two of the five resident artists are Kendal residents — quilter Nancy Garver and sculptor Ted Nowick. MindFair Books sells used and new books, with a special focus on literature and poetry, social sciences, and arts and crafts. The bookstore is located in Ben Franklin, a walk back in time with fabrics, a frame shop, toys and a piano for customers’ enjoyment. Ratsy’s Store is a little of this and that, old and new. “Strange Socks, Sunglasses, Unusual Gifts, Vintage and Recycled Clothing, Flannel Shirts, Mom Jeans, Records, Curiosities and Odd Items you hadn't realized you wanted,” is how owner Ratsy Jo Kemp describes the store. Step out of your comfort zone for a high-flying adventure. “Common Ground Canopy Tours is a state of the art Zip Line Adventure that takes you up into the treetops of the breathtaking Vermilion River Valley. Our guides will be with you throughout the tour, which takes about 2½ hours to complete,” Common Ground folks explain, adding that patrons are as young as 10 and as old as 70 plus. Five miles west of Oberlin on the East Fork of the Vermilion River is a unique music venue called Riverdog. For more live music visit one of the many local wineries located near Oberlin. The area is also home to local peach and apple orchards and lots of markets and roadside stand selling corn, tomatoes and the like. Kendal at Oberlin is committed to social responsibility, providing leadership in the greater Oberlin community and making our Kendal campus available to serve the larger community. If you are looking for a vibrant and active retirement community in Oberlin, schedule a visit with Kendal at Oberlin or visit us online. What are your favorite Oberlin destinations not listed on this tour?